Hello groovyReaders! Today on this sleepy Sunday I was thinking about it – multitouch, or just touch gestures themselves have really made their way into our tech lives and can be seen on mobile devices, laptops, screens and… Photoshop! 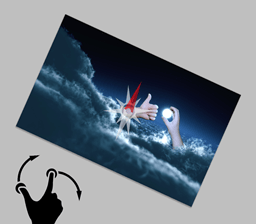 Yes, as a matter of fact Photoshop supports a number of multitouch gestures that can help you navigate easier and faster than just using the regular Photoshop Tools. Let’s get started! Perhaps everyone knows this. Pinch to zoom is easy to use and works like a charm in Photoshop. Take two fingers and move them inwards to zoom out and outwards to zoom in. It’s as easy as that. After zooming in, you can use two fingers (or three, depending on your device) to navigate around the canvas. Place two fingers down and move towards any direction – horizontal or vertical. Some devices support free navigation, meaning you can also go diagonal and move freely. Rotating is as easy as taking two spread apart fingers and moving them in a circular motion to the left or right. Need to do a Free Transform but you don’t want to reach over to your keyboard for a Ctrl+T? No problem. 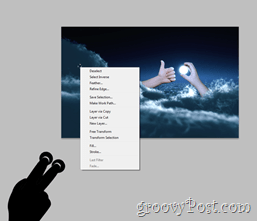 You can open the context menu anywhere you need it with a single two-finger tap. You’re done! Do note that your multitouch device may have way more potential than these simple gestures. Check your instruction manual or your manufacturer’s website to view more information about the device gestures. Oh, and if you feel like you want to try out what you can do with Photoshop and multitouch, try one of our Photoshop Tutorials. Hi, was reading through this post- are you sure this works on any multitouch enabled device? While that should be the case- apparently PS5 (at least) only seems to work for this multitouch using Apple’s Magic-Touch pad (or MacBooks) with this series of touchpad. It also does not work apparently with PC versions of Photoshop. Let me know if something you’ve done works differently, or other devices supported.